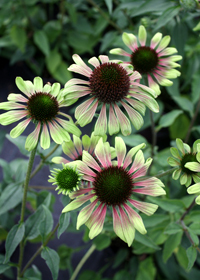 Light green petals blend to light pink at their base, contrasting with the dark green cone. With age, blooms become more pink, in some cases totally pink, and the cone changes to burgundy. Best in part shade.